Food is supposed to sustain and nourish us. Eating well, any doctor will tell you, is the best way to take care of yourself. Feeding well, any human will tell you, is the most important job a mother has. But for too many of us, food now feels dangerous. We parse every bite we eat as good or bad, and judge our own worth accordingly. When her newborn daughter stopped eating after a medical crisis, Virginia Sole-Smith spent two years teaching her how to feel safe around food again — and in the process, realized just how many of us are struggling to do the same thing. The Eating Instinct visits kitchen tables around America to tell Sole-Smith’s own story, as well as the stories of women recovering from weight loss surgery, of people who eat only nine foods, of families with unlimited grocery budgets and those on food stamps. Every struggle is unique. But Sole-Smith shows how they’re also all products of our modern food culture. And they’re all asking the same questions: How did we learn to eat this way? Why is it so hard to feel good about food? And how can we make it better? September 17, 2013. It is the day before my daughter Violet’s one-month birthday. It is also the first day that she will almost die. Virginia Sole-Smith is a freelance writer whose work has appeared in the New York Times Magazine, Harper's, Slate, and Elle. She is also a contributing editor with Parents Magazine. She lives with her husband and two daughters in the Hudson Valley. 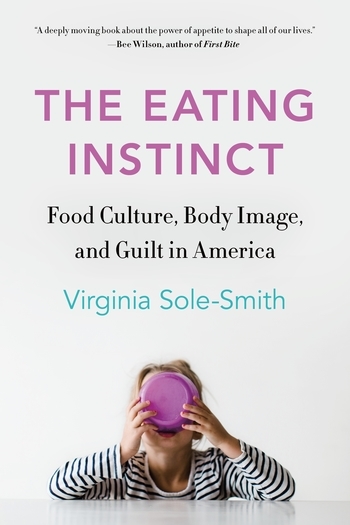 Virginia is the author of The Eating Instinct: Food Culture, Body Image, and Guilt in America.